Birch Chalet offers cosy accommodation with spectacular mountain views. Located in the grounds of Clachaig Inn, it's handy for both mountains and the famous Boots Bar. Lots to do in and around the area, using ferries to get to outer islands, driving around Ardgour and surrounding area, stunning sheltered bays and silver sand. Lots of forestry walks alongside tumbling streams. Red deer, seals and numerous birds seen. Information centres good place to pick up leaflets and then just get out there and enjoy this beautiful area. Ballachulish slate quarry and Brecklet trail walk well worth seeing. Using Corran Ferry to get across closer to coast well worth it to get away from mountains if weather a bit wet. Coming back to a warm comfortable chalet at the end of a fantastic day just the icing on the cake. Dear Elaine, Thank you for your great review, glad you managed to explore so much of the beautiful surrounding area. Hopefully we will see you back soon. We've always liked the Clachaig Inn, but tended only to pass through for a quick meal or overnight stay. This time we wanted to stay for a week and really get to know the area. A self-catering chalet at the Inn seemed the best of both worlds - self-catering, but able to pop to the bar for food / drink when we fancied it (great range of Scottish real ales, all of which were sampled!). Great walks straight from the front door, and excellent location for a base. Our hobby is landscape photography, and despite the (anticipated!) poor weather, we were in our element. Chalet itself is well-appointed, has all mod-cons and everything you need for a cosy stay. Good day out on the hills despite rain. Good hot showers and Birch was warm and comfortable. The nearby Inn was very useful. 7th visit to the lovely Clachaig Inn, the chalets are great accommodation to explore the local area and enjoy the Clachaig Inn.. booked again! Clachaig Inn is set in Glencoe, rugged, world famous and located next to a forest and amongst some of Britain's highest mountains. Nearby walks in the forest and to Glencoe village are easy and full of interest. Birch cottage is set in the grounds and away from the Inn. 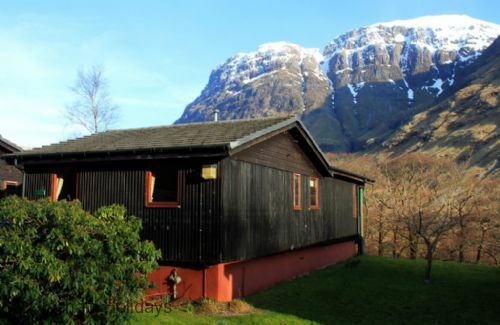 Warm and very well equipped the cottage has excellent views over Glencoe, the river and huge mountains. Stayed in the neighbouring chalet last year (2017) and was identical in every respect (superb accommodation and value for money) - suited our needs perfectly. Took two Glencoe rookies with us this time - both blown away with the scenery, location and chalet - pretty much everything. Weather not great but didn't 'dampen' our spirits in any way! Would recommend the accommodation to anyone of any age - just brill! ...the chalet, the cleanliness, the bar, the location. Except for the beds which are too small for 6 foot couples. We have experienced approximately 30 self catering holidays, Clachaig Chalets rank among the best. I am a severely disabled person, accommodation suitable for my requirements is rather hard to find. Birch Chalet, however, although not fully converted to suit every disabled, was ideal for my wife and myself. The raised walkway to the entrance was ideal although the the doorstep was difficult to negotiate. The site is excellent, located in what we consider to be the find to be the best area in Scotland. The Clachaig Inn provides a very useful place if you do not want to cook every meal yourself. It offers a good range of ales, the food is very good and reasonably priced and the staff, even though some were recent recruits, were friendly and helpful. The only thing we found a little disappointing was that on enquiring about the cost of a four week booking in Winter there was no lower price on offer. We fully enjoyed our stay, we have recommended Clachaig to lots of people. We are in the process of booking time for a two week stay in November. Thank you for the opportunity to comment on a really good stay in a brilliant environment. Always a pleasure to return. Always a pleasure to return as we have for many years. Beautiful surroundings and chalet. Love it! Thank you. Good to hear. See you again soon, we hope. Birch Chalet was in a perfect location. it was set amongst woodland and mountains with lots of walking directly from the chalet. The chalet itself was clean and very cosy with everything we needed. Staff were friendly and welcoming. We had preordered a food box which was really useful and it included some complimentary smoked salmon which we greatly appreciated . We arrived at Clahaig in daylight and after an already spectacular journey across Rannoch moor it was unbelievable to arrive at our destination with the most majestic backdrop of the snowtopped mountains. Absolutely incredible. It was trying to snow and the air was very cold so it was with delight that we entered our chalet with the heating on. We soon lit the wood burner and settled in for the night. There was everything we needed in the chalet for our stay. During the week of our stay we had a few visits to the Boots bar to sample the local beer.....delicious. On our travels out and about we bought some very fresh seafood; mussels, crab and scallops. Excellent!! The staff at the inn were extremely helpful and friendly. Good to hear that you had a great time. But no decent beers? Which bar were you in? Clachaig Inn doesn't stock national brands which some find odd, but instead chooses to offer a wide range of craft cask and keg beers from Scottish independent brewers. Warm, cosy, clean and private. Wonderful views which , due to the weather , changed every day . The furniture and curtains had been updated since our last visit which was nice . The chalets just give that extra bit of flexibility which rooms in the hotel don't have. I'm sure we will be back again for another visit soon. Ideally located for anyone wanting to do some walking, climbing, skiing (weather permitting) or just relaxing. The Clachaig Inn has great food, lots of different beers & whiskys & friendly folk to chat to. The bars may be on the doorstep but there is no late night noise as the chalets are behind the main building. The chalet itself is very well equipped, & the views are beautiful. There are complementary toiletries which are a useful, thoughtful touch. Only downside - if you can call it that - is no or very little internet connection, although that's good if you want to get away from the world & relax. Once you've visited Glencoe you will want to return again & again. Excellent accomation but the steak meal in the Inn was a real disappointment, very tough. The cabin is wll equipped and the location perfect. The only disappointment was the one meal we had in the Inn which cost a lot. We had sirloin steaks which were extremely tough and at £18.95 times 2 plus drinks very expensive. As it was not my treat I felt I could not raise the issue. Long way from Cornwall to Glencoe but worth every mile. Actually the varied journey is part of the pleasure (apart from M6 return but we can overnight in Brum) Been coming for years and the beauty of the area still stunning.Living in Cornwall; holidaying in Glencoe. Can't be bad! Why do people go "overseas"? Early menus had curries, chilli con carnie, cheesy nachos etc. ie. climbers/ walkers "grub". Seem to be absent currently? Minor crit. for a brilliant location and accommodation (a wide variety), food, pub,and entertainment. There are those of us who live in Glencoe and holiday in Cornwall every year. Seems to be a good pairing! Good to have you back again. Must have hit the inn on the wrong day as our daily specials regularly feature chilli and various curries. Admittedly it's been a while since we last served nachos. Hope the surf's up down there and see you back in Glencoe sometime soon. We stayed for 1 wk the views were fantastic and the chalet was very comfortable,we saw a beautiful stag and his hinds nearly every morning. We are returning as soon as we can.The boots bar has a friendly atmosphere and great food,i would also highly recommend for families too all in all it was a fab holiday. Good to hear that you met the local wildlife. They've been getting quite close during these colder periods. Look forward to welcoming you back. Really loved our stay over Christmas in Birch Cabin. A little bag awaited us with bubbly, chocolates and a christmas card. There was even a little tree for us. The kitchen was incredibly well equipped, so much so that I could cook a christmas dinner with ease. The cabin was lovely and warm and the views were incredible. With it being Christmas we thought a little present from us would be appreciated. Good to hear that you had a great time.